Click 'Add to Cart' when buying more than one copy. Note: After making a purchase through PayPal, BioXing will be notified and a version will be prepared and made available by BioXing. That is, PayPal does not contain a version for downloading since each version has a unique key. Microsoft's Windows 7 and 10 Desktop version. This desktop version for Microsoft's Windows 7 and 10 operating system is designed as a standard windows executable. The desktop version and the Windows 10 Universal Windows Platform (UWP) version (obtained directly from the Windows Store) have virtually the same views and capability. Refer to the tablet version for images of other views not shown below. Note: the desktop version can also be used on tablets. Some operations can be performed using touch; however, the desktop version was designed more for use with a pointing device such as a mouse. The Fungicide App, in addition to the Periodic Table of Fungicides view, has a number of different views based upon the properties of the fungicides such as alphabetical name, by crop name, by class name and Mode of Action (MOA) . Clicking on a button will display the corresponding View. 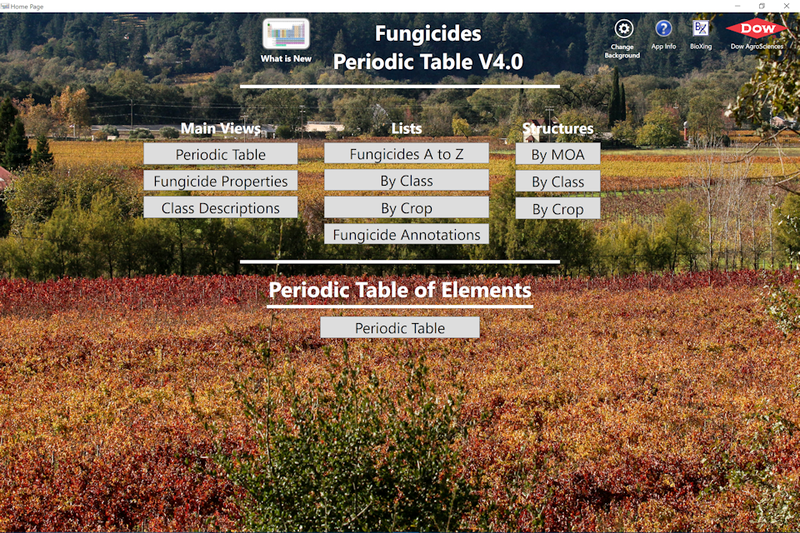 Periodic Table 4.0 - displays an interactive periodic table where selecting on a fungicide cell will display the properties of the fungicide. Fungicide Properties - displays the properties of the currently selected fungicide. Fungicide Annotations - displays the annotations for all fungicides and permits editing existing annotations and adding new ones. The desktop version permits multiple date-time stamped text and picture annotations for each fungicide. Application permits use of multiple annotation files. For example, one could be a reference annotation file and the other could be for general observations or documentation. The desktop version for Windows 7/10 and the Windows 10 UWP App version use the same format so annotation files could be used on multiple computers or tablets. Class Descriptions - displays the complete list of classes and their descriptions. Fungicides A to Z - displays the complete list of fungicides in alphabetical fungicide name order - selecting a fungicide name displays its properties. By Class - this has two views -- one view shows a list of fungicides for a class by name and the other displays a molecular structure for each fungicide. Selecting a fungicide name or structure will display the properties of the fungicide. By Crop - this has two views - one view shows a list of fungicides for the selected crop and the other view and the other displays a molecular structure for each fungicide. Selecting a fungicide name or structure will display the properties of the fungicide. In addition, an arrow will be placed next to all other crops that the selected fungicide can be used for. By MOA (Mode of Action) - This view displays structures of fungicides that have the selected mode of action. Selecting a fungicide structure will display the properties of the fungicide. Element Periodic Table - displays an interactive periodic table where selecting an element cell will display the properties of the element. The following view shows the Main Menu where the different views are launched. Clicking on a button will display the corresponding View. 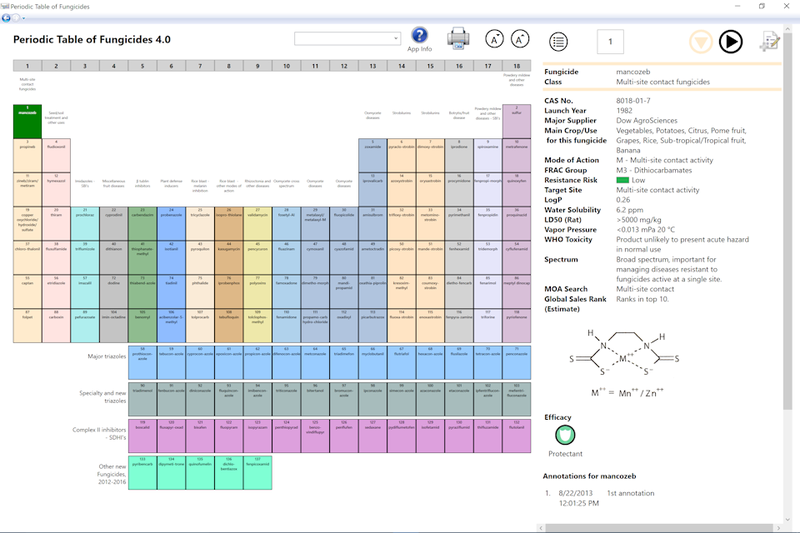 For example, Clicking on the 'Periodic Table' button will display the view shown below the Main Menu view. Periodic Table of Fungicides with Data-View for selected fungicide at position 1. Clicking on the small arrow button in the upper left corner will return the App to the Main Menu View. Clicking the various arrow buttons in the upper right of the view will move the fungicide selection to either the previous/next fungicide position or the previous/next fungicide in the class. Clicking on a fungicide cell within the table will select the fungicide. Clicking on a print button will either print the table or the data view. Clicking on the App Info button will display the legend and other information relevant to the table and the App. Clicking on the new annotation button (page symbol with plus sign and pencil) pops up a view for entering a new annotation.